The HQ 3rd Division Association holds an annual pilgrimage on the eve of ANZAC Day, to remember the service and sacrifice of its members during a period that spans 1916 to 1991. 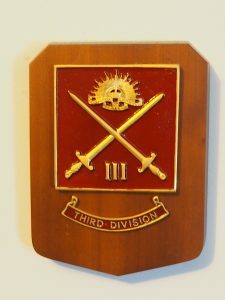 The 3rd Division (infantry) of the Australian Army was formed during the First World War within the Australian Imperial Force. They served on the Western Front in France and Belgium, participating in the battles at Messines, Broodseinde Ridge, Passchendaele, Amiens, and the St Quentin Canal. In the interwar years they operated within the Citizen Forces based in central Victoria, with fluctuating numbers caused by the Great Depression and peacetime operations. 3rd Division mobilised for the Second World War in December 1941 in a defensive role before being deployed to New Guinea where they engaged the Japanese Forces between 1943–1944. In late 1944 they were sent to Bougainville where they advanced across the island until the conclusion of the war in August 1945. They disbanded in December 1945 but were later re-raised in 1948 as part of the Citizens Military Force. They served through the Cold War as a reserve formation until 1991 when the division was disbanded for a final time due to an Australian Army restructure.